Back breaking but worth it! I’m tired. I ache. 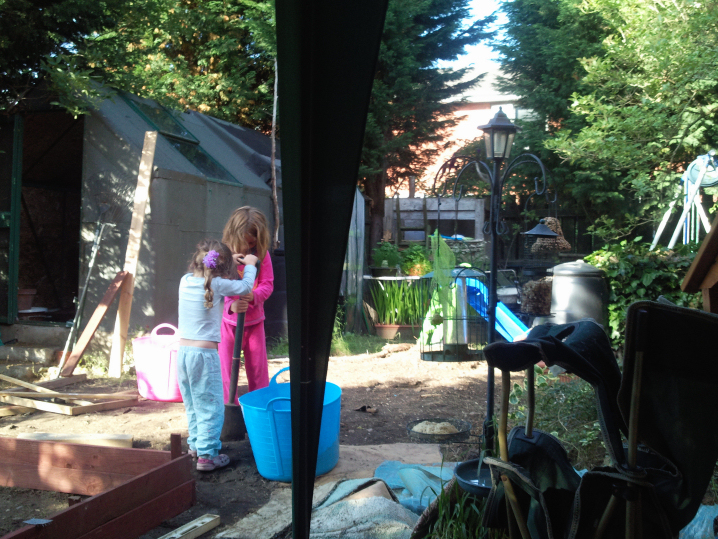 It’s ok, though, because slowly, very slowly, the garden is taking shape. I must admit, I’ve not done as much today as I could have done but today’s work involved a lot of bending and I had to rest more often. It was more enjoyable yesterday because Ant and I worked on it together. It is nice being out there on my own for the most part, especially if I’m planting seeds or watering the plants, you know, nice easy jobs, not back breaking ones! It’s great working on the garden together with Ant, though, and must admit to feeling a little lonely out there, by myself, today. 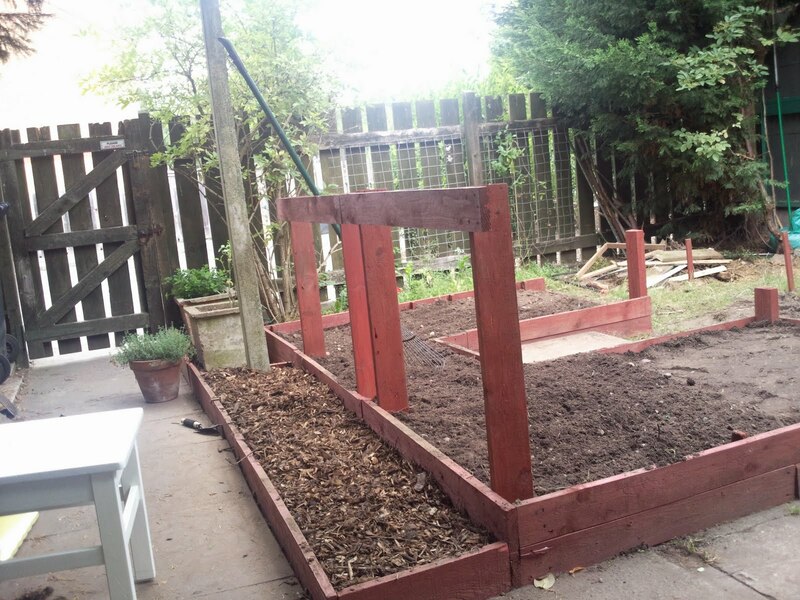 I dug three bags of compost into the raised beds. 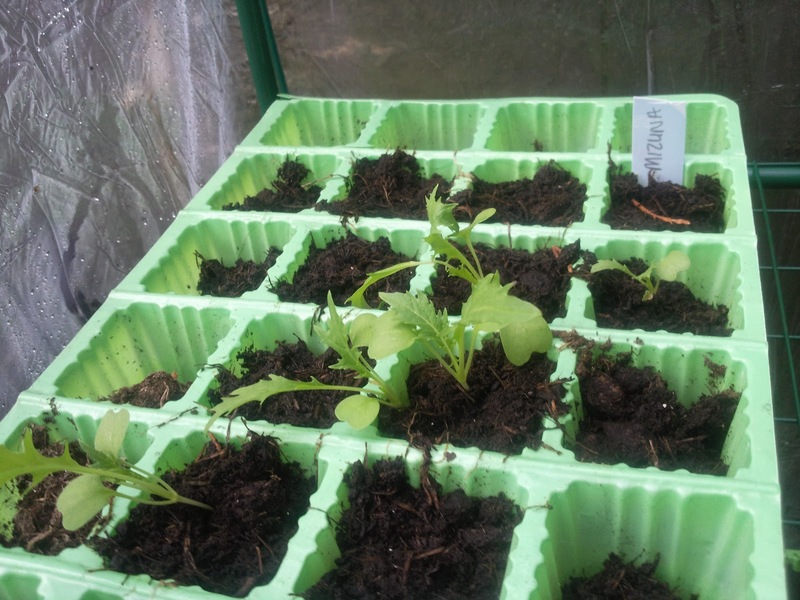 Tomorrow I can plant out the mizuna and mustard leaf. In the next week, I need to harden off the celtuce and amaranth ready to plant them into the beds. 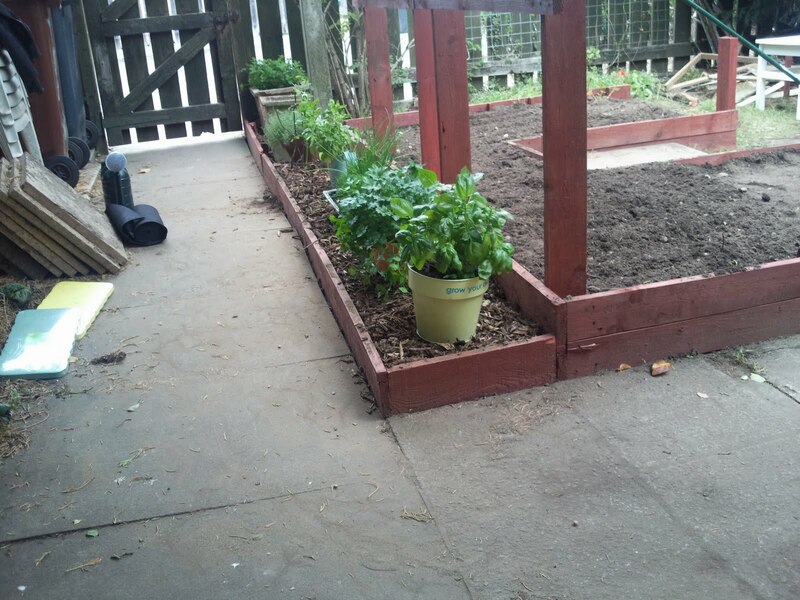 I covered the new border with weed control fabric and bark. 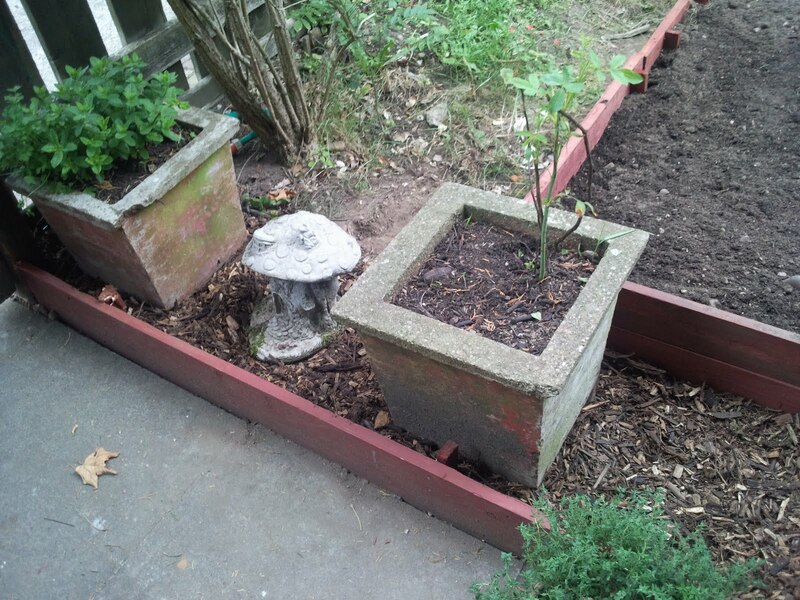 Two rose plants were transplanted. One was in a container. 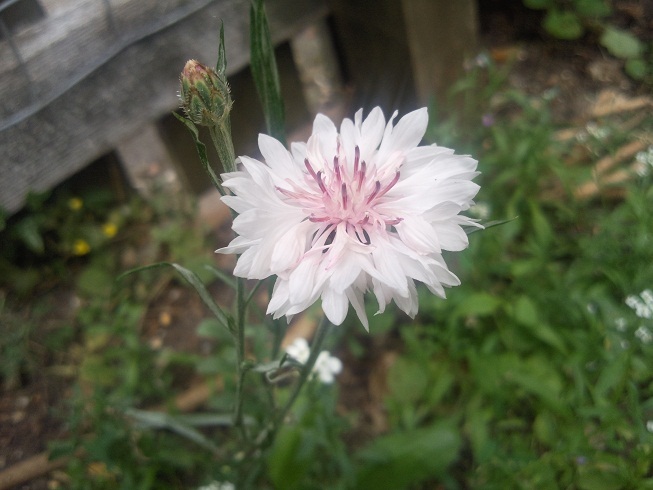 The other one had popped up in the garden from some unknown source, into the new border. I was getting pretty sore by this stage but I made a start on levelling out the old flower border ready to cover with weed control fabric and bark then my little Ella came home from nursery so I used that as a good excuse to go have lunch and rest! There were some baby snails happily munching on my french climbing bean plants yesterday. I took them off but couldn’t bring myself to kill them….they are babies after all! 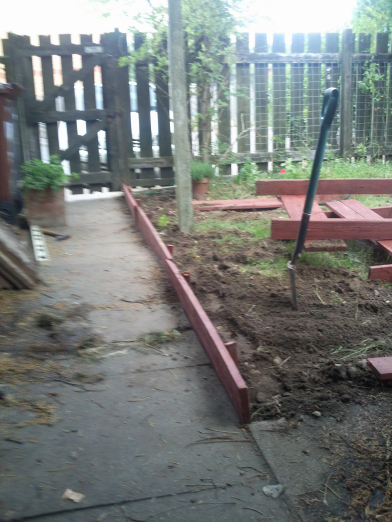 We did put slug pellets down, though, which I felt a little guilty about. We need to find a better to stop the snails munching our food! Ideally, we’d like this border to grow herbs and lavender. We’re not sure if it’s going to get enough sun to keep the plants healthy. 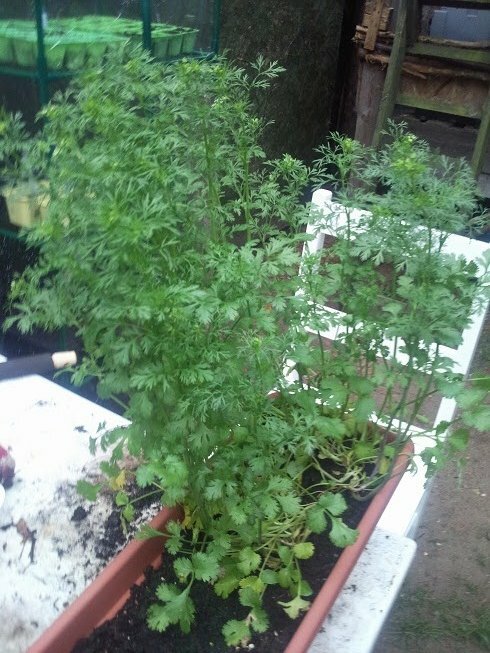 I’ve put my pots of herbs in position to see how they get on. Fingers crossed they like it there. It will be perfect for the herbs as it’s close to the kitchen door. We were on a roll in the garden yesterday, until the rain decided to drop in on us! 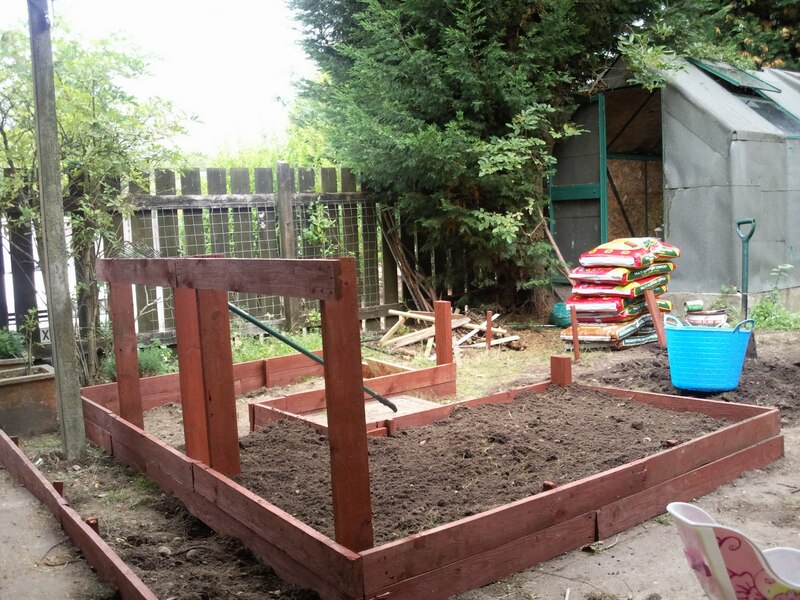 Ant had all but finished the woodwork for the raised beds (we’re waiting on more wood being delivered) and we’d started to fill it in with soil. 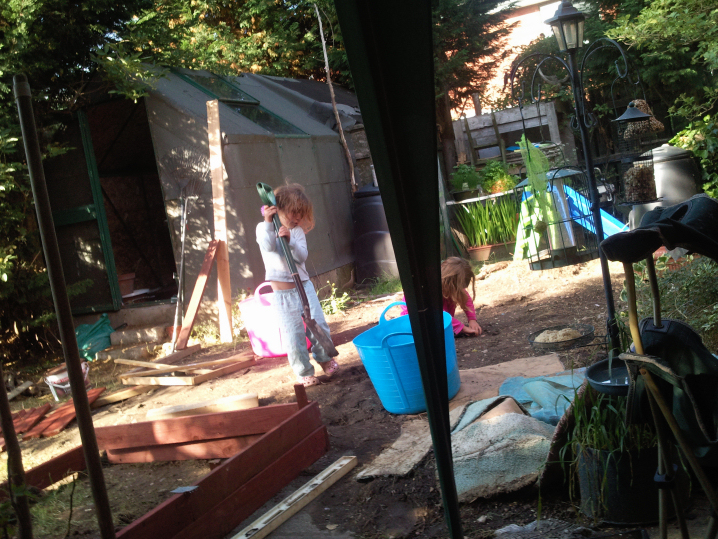 We’re taking the soil from the garden as that’s where we put all the extra we dug out of the pond a few years ago. We spread it over the lawn area so it raised it up a bit then covered it with turf. 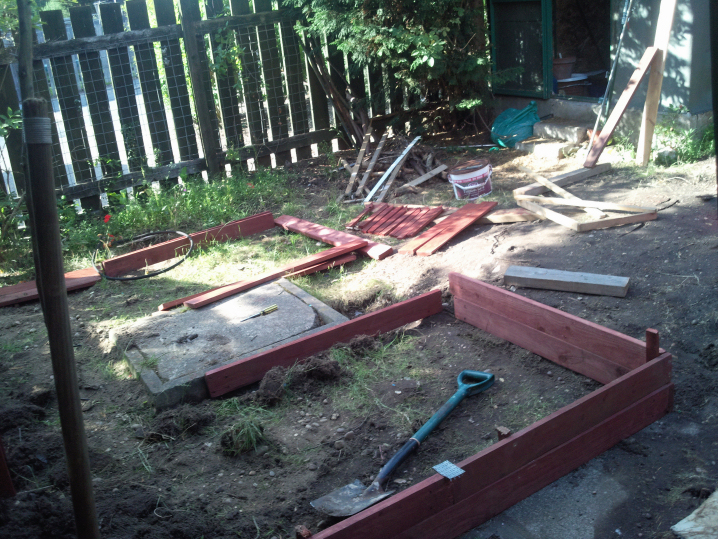 Now we have to dig it all back up, which was made a lot easier by my brother coming and rotavating it the other day. We bought some trugs, which are great for shifting the soil from one place to another and we got half of the bed filled before the rain started. Today’s plan is to do the ironing before anything else :/ then get out in the garden and start digging up a load of stones from the old pond. 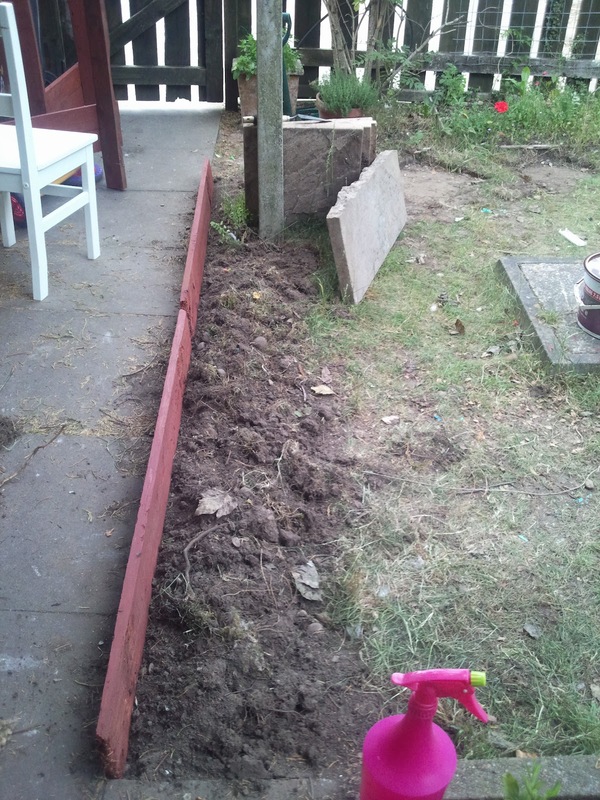 We’re going to line the bottom of the border with stones to aid drainage then fill with a mixture of soil and compost. Any ideas will be gratefully received! Not much to say today because I’m really tired. 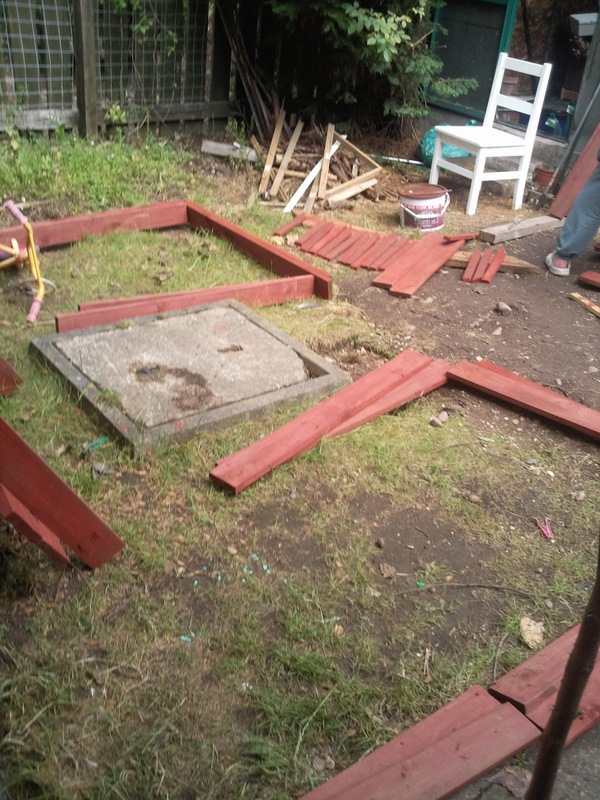 I do, however, want to say a huge thank you to my super wonderful husband who has been working on my raised beds for the best part of the day. 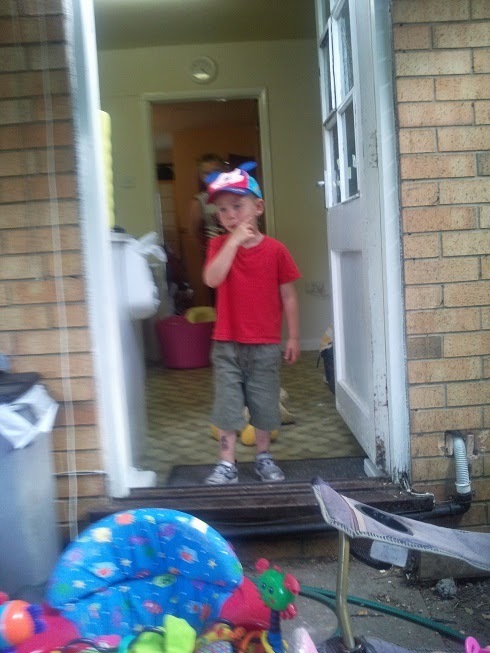 He’s gone to bed aching all over…..here’s hoping he doesn’t suffer too much tomorrow. 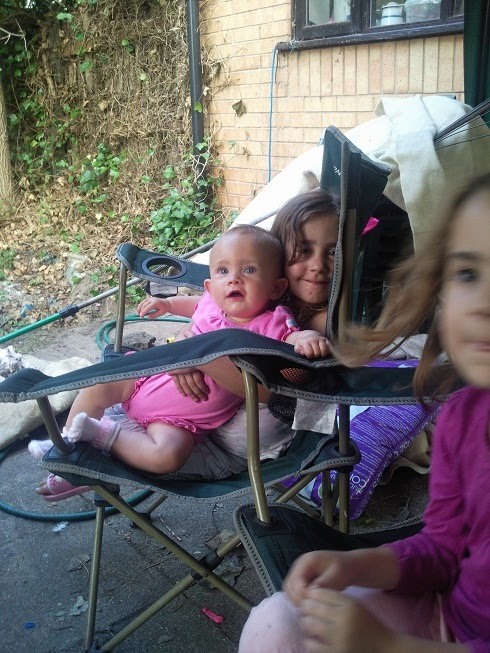 A little help from the girls, who for reasons known only to them, are in their pyjamas!! We put the umbrella away when Daddy reminded silly Mummy that it’s not safe to use one in a thunderstorm! 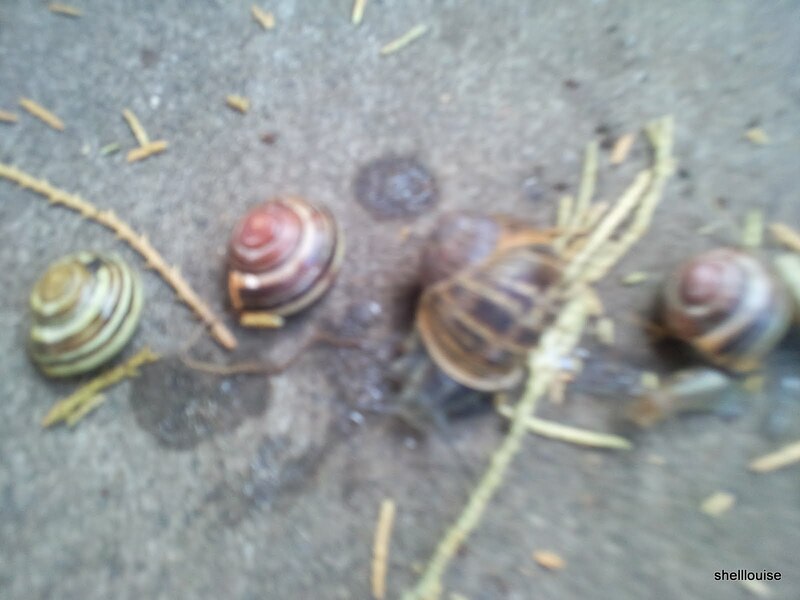 This morning was all about snails for the girls. I don’t know where they got them from but I made sure they took them back there and didn’t let them go in our garden! 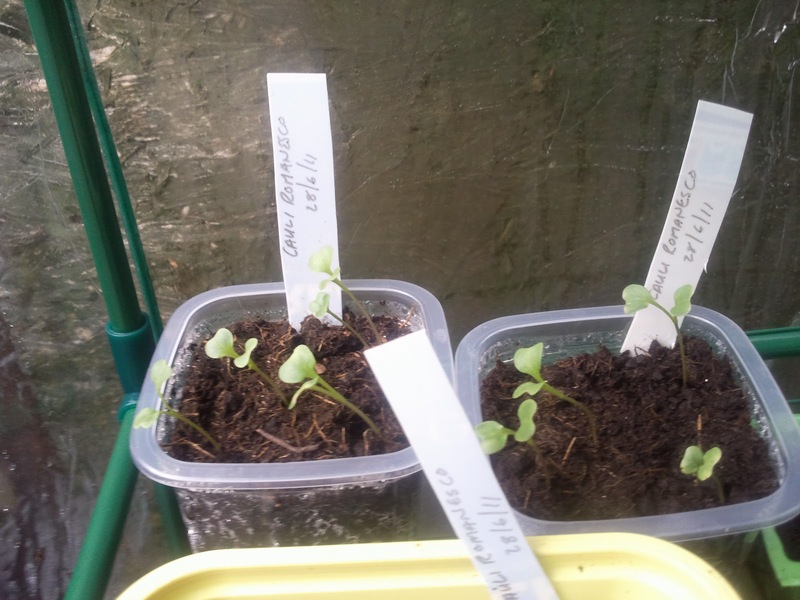 and I surprised myself with how excited I actually felt when I opened my greenhouse and saw that all my seeds have started to grow! I turned round to share the news with Ant and must admit to being a little disappointed when I found he’d gone inside and there was no one there to show my accomplishment to. 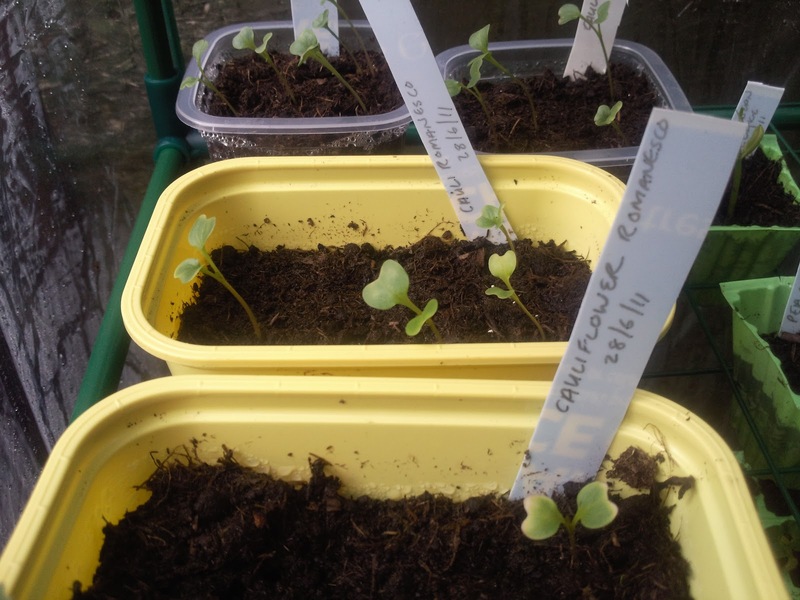 I hope we like all these different salad leaves I’m growing! This one is celtuce. 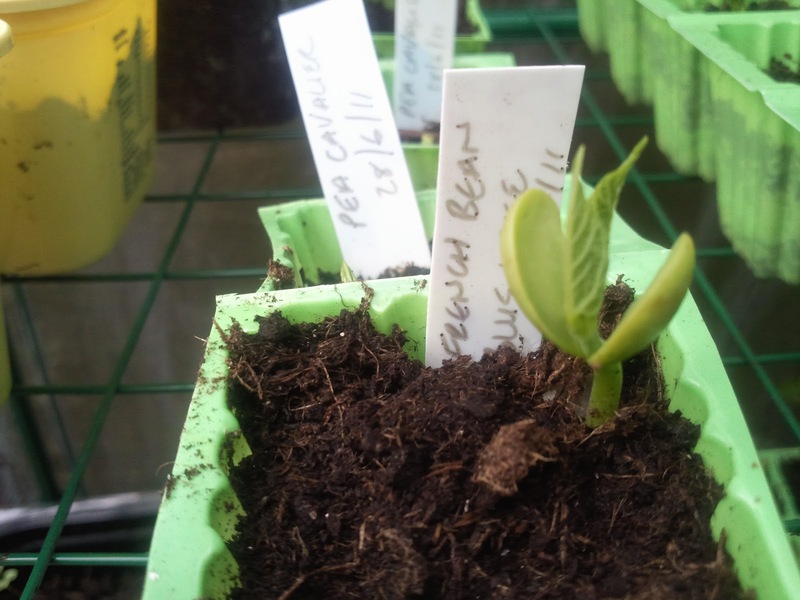 I’m very proud of my little seedlings and took loads of pictures! This is mizuna, which I have to admit, I’d not heard of before. I’m very eager to get my beds finished so they’re ready to plant out my seedlings. Thankfully, my husband is brilliant at woodwork and has made a start on the beds. I could probably make them myself but I know they’ll look a lot nicer and last a lot longer if Ant makes them! He’s busy with work though so we have to grab time in the garden in between his call outs and fixing laptops/computers at home till late into the night. 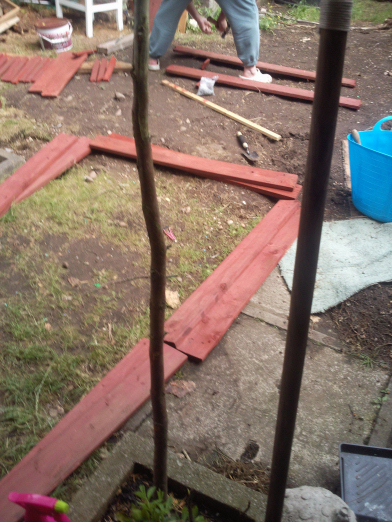 The next job is to secure the wood for the border, get some weed control fabric, compost and bark or stones and then decide what plants I’m going to put in it. 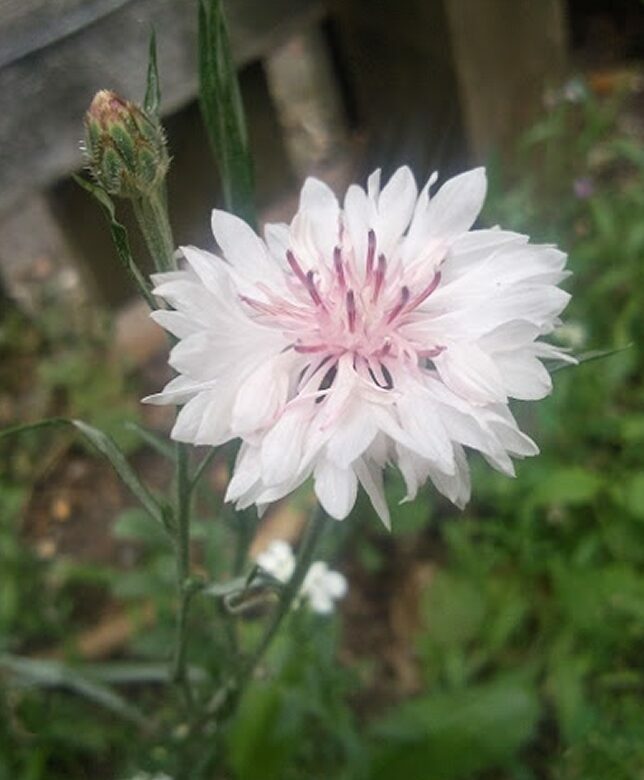 I’m enjoying learning about all the different plants, soil types etc and I’m very pleased I started to take more of an interest in our garden. 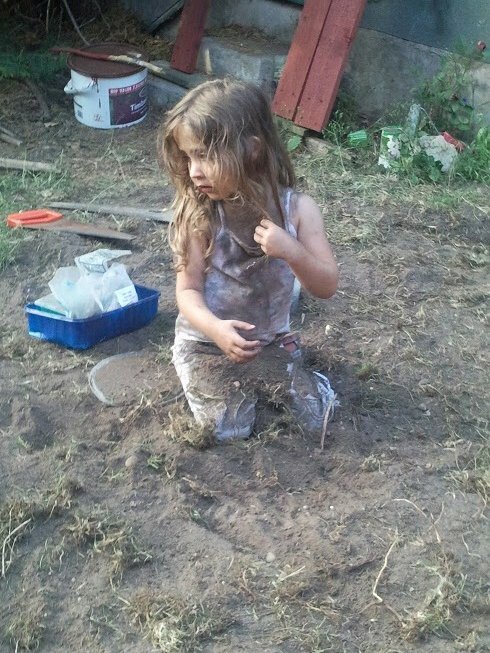 James came to help with the redesign of our garden. He brought his rotavator so we didn’t have to dig the lawn up with a spade. I was very grateful! 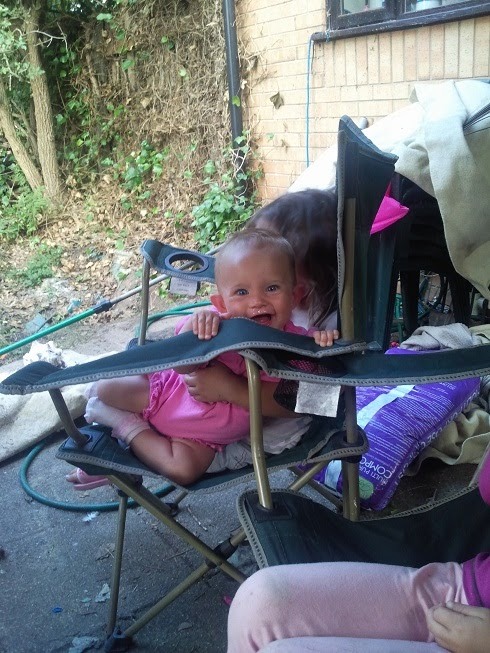 and my beautiful niece, Megan (9 months). She’s such a smiley little baby 🙂 She makes you happy just looking at her. 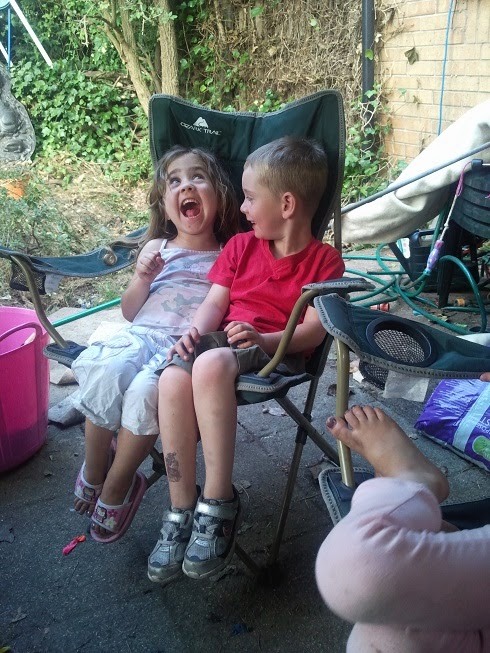 I love seeing the cousins playing together and I’m looking forward to having my sister’s children coming to stay in the summer holidays. 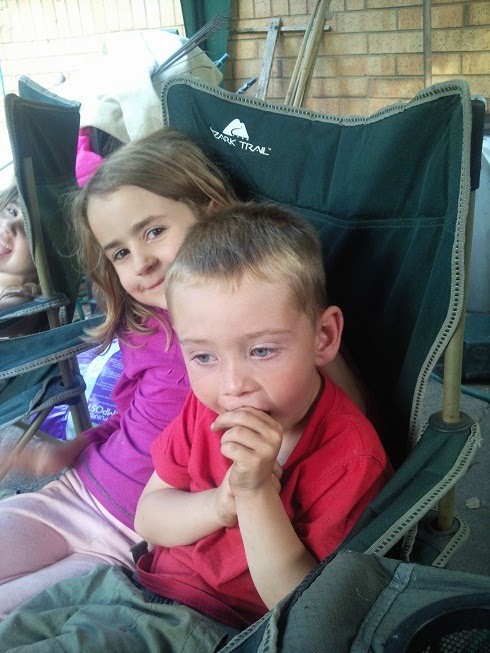 Having a big family is wonderful and even though I love my life here in Lincoln, I do miss living close to my brothers and sisters, nieces and nephews. I’ll be forever grateful that the girls and Aiden get to visit Derbyshire every week and are growing up with their cousins. 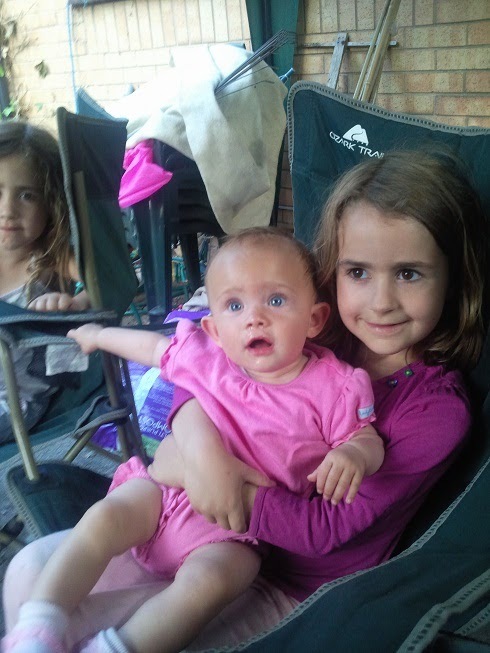 I hope as they grow, they continue to love each other and always be there for each other. My attempt at growing my own is going ok, so far! 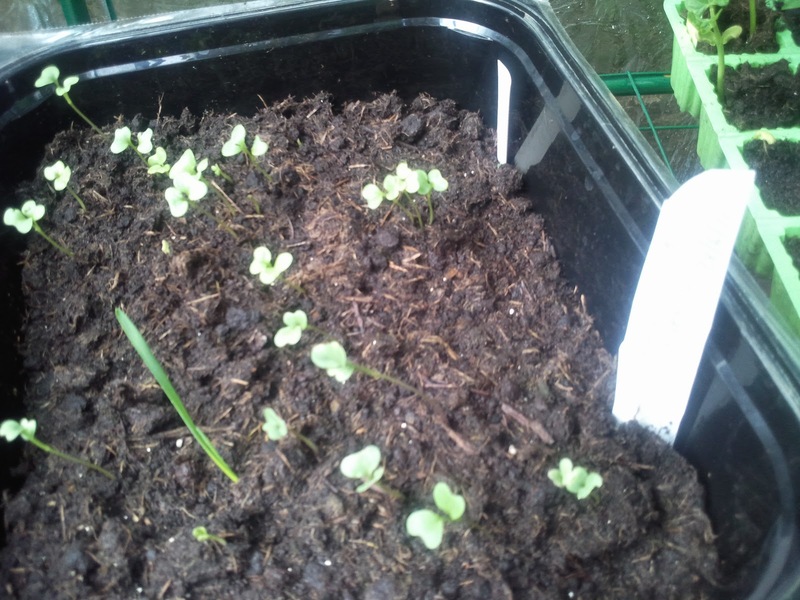 My herbs, apart from one basil plant, which I think has been food for some kind of caterpillar, are doing really well. 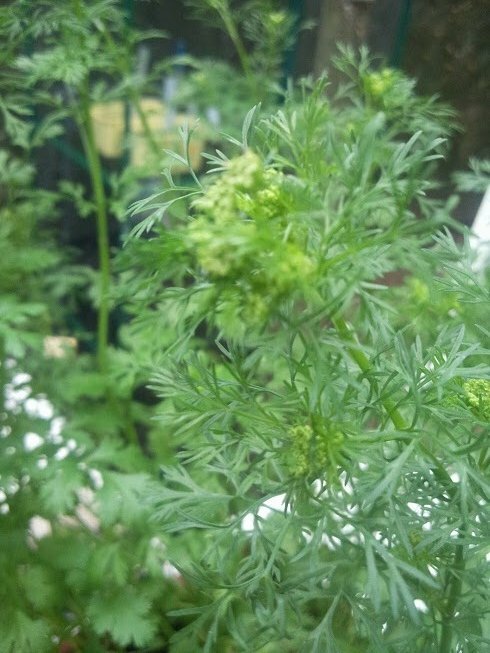 The coriander, which is one of 2 herbs that I’ve grown from seed, looks like it’s going to start flowering soon *smiles*. It’s getting very tall and I’m looking forward to harvesting the seeds. Don’t know what I’m going to do with them though because I don’t like coriander! I’ll probably just grow more and more and end up with tons of seeds that I’ll have to try and give away! marmite-ish-ness about it (ok, so I know it’s a made-up word but it sounds good to me lol) and for those who don’t know what my made up word means, it means, you either love it or hate it. I’ve never liked it and can tell 99% of the time if a dish has it in. However, I do like growing it. It was very easy to grow from seed and it gave me the confidence to try other things so I’ll forever have a soft spot for coriander! 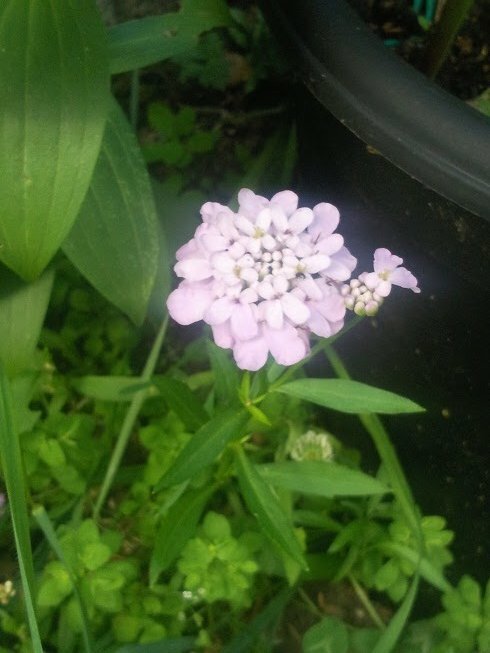 I’ve also had some success with a box of wildflower seeds. We’ve bought wildflower mixes loads of times but they never really did anything. I don’t know what any of them are called but I don’t mind; they’re pretty! 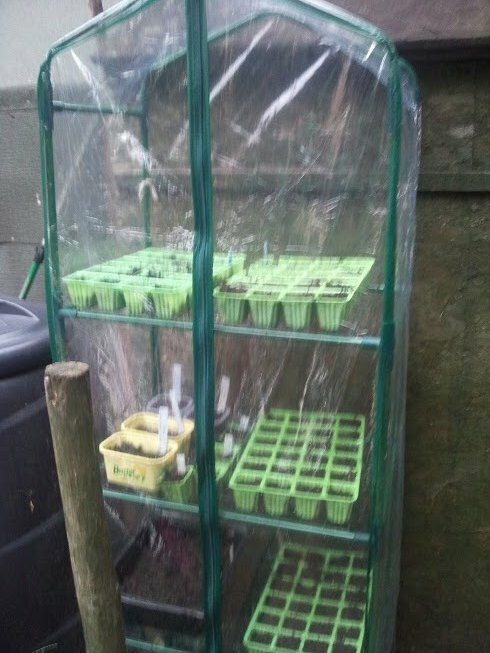 I’ve planted some peas, french beans, Sicily purple cauliflower, Aalsmeer cauliflower, romanesco cauliflower, amaranth calaloo, celtuce and mustard leaf Indian green amsoi. 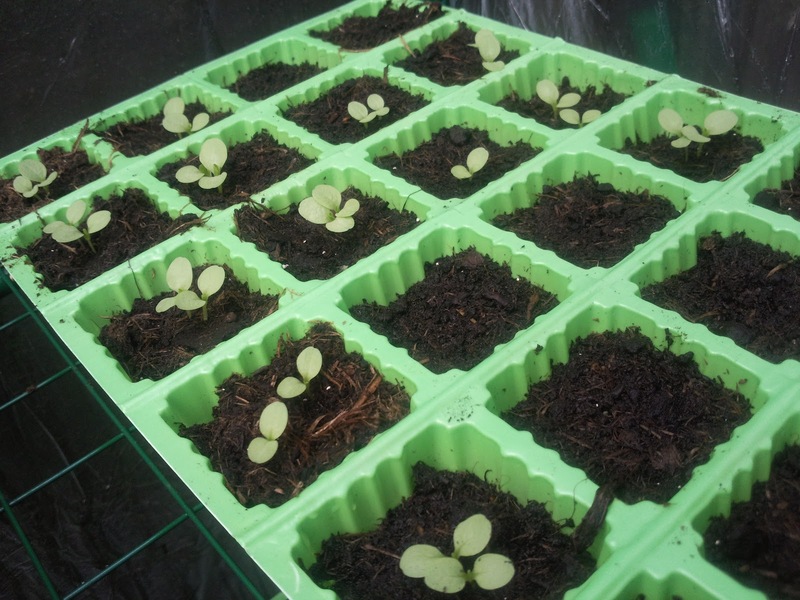 I ran out of seed trays so used some margarine and coleslaw tubs and I cut up an ice cream tub to make the labels. 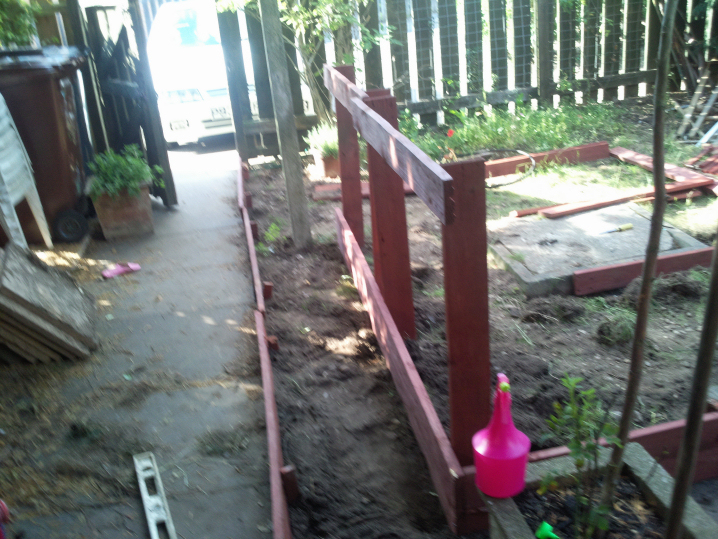 My brother’s coming to rotavate our garden and then we’re going to make some raised beds. I can’t wait to get growing all different kinds of vegetables. 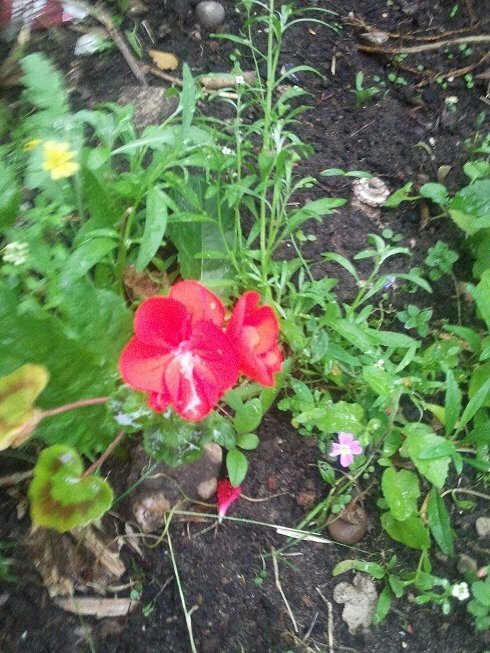 Last year, KayCee was given a geranium from a lady on the street and after having it in the window all winter, I decided to plant it out. I thought I’d killed it but today I saw a flower on it so it’s doing ok and I’m very pleased about that because KayCee wouldn’t have been very pleased if it wasn’t! The weather yesterday was wonderful here in Lincoln. It was far too hot to get anything done in the garden but it was perfect for sitting under the canopy, watching the world go by. Which is what I did for most of the day! As I sat looking around the garden, thinking of all the things that needed doing, and feeling a bit overwhelmed by it all if I’m honest, I heard a strange sound. It sounded like very loud crickets or something similar. It was coming from the fence where we had attacked the ivy a couple of weeks ago. We knew there was a bird’s nest high up because we’d seen the sparrows collecting stuff to make it so we kept clear of that area. 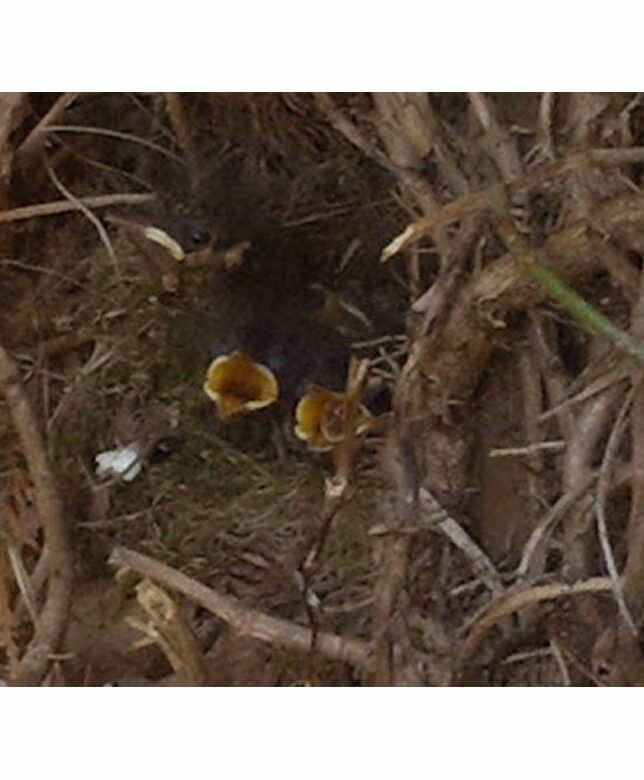 We didn’t, however, know that a robin had made her nest very low down in the ivy. It turned out, the noise was the babies, calling for food every time their mother went near. I was delighted and quickly took some pictures. I sat and watched the mother bird going to and fro, feeding her babies and I thought how lucky we were to have this wonderful thing happening in our garden. 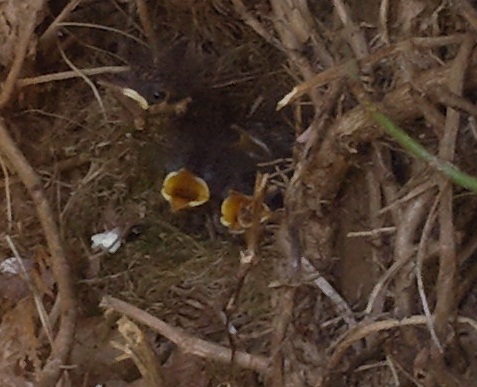 I worried, though, that because we’d cut the ivy, we’d opened the nest up to predators and my concerns were to be confirmed when I went to check on them this morning. The nest is empty. I couldn’t help but cry. It’s my fault these four, beautiful little birds are dead. If only I’d listened to Ant when he said we should wait a while to cut the ivy, they’d be safe in their nest now. I feel so guilty and will never, ever, touch that ivy in spring again. I thought we were safe cutting low down because I never thought a bird would make its nest that low. After never being able to grow anything before, my gardening skills seem to be improving at an astonishing rate! 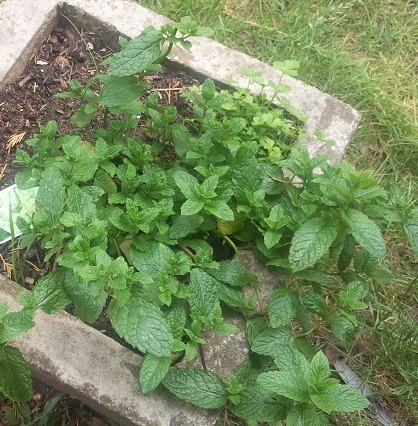 I started off a few months ago by planting some herb seeds. I didn’t hold out much hope because every time I tried to grow anything, it didn’t happen. I stopped buying houseplants because they always died and I felt guilty! Coriander is one of the few herbs that I’m not very keen on but hey, it’s growing, and even if I never use it in cooking, it looks lovely in the garden. I soon had the gardening bug and ordered some Gladiolus callianthus bulbs. I planted them in the middle of April and they’re doing great. They should flower around August and I’m looking forward to smelling the perfume these gorgeous flowers have. 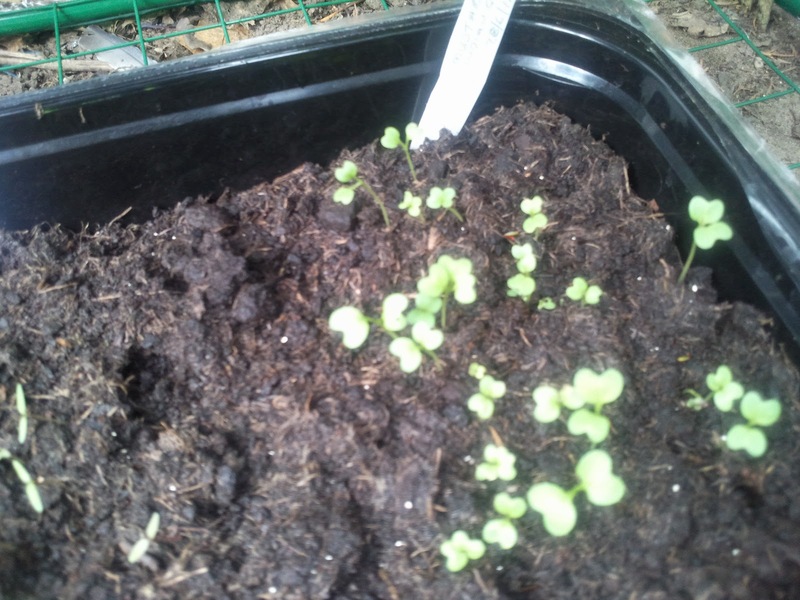 I have to confess that I didn’t bother buying more herb seeds, I cheated and bought herb plants from the supermarket when they were on special offer. Instead of putting them on a saucer in the window, I planted them in an assortment of containers in the garden. 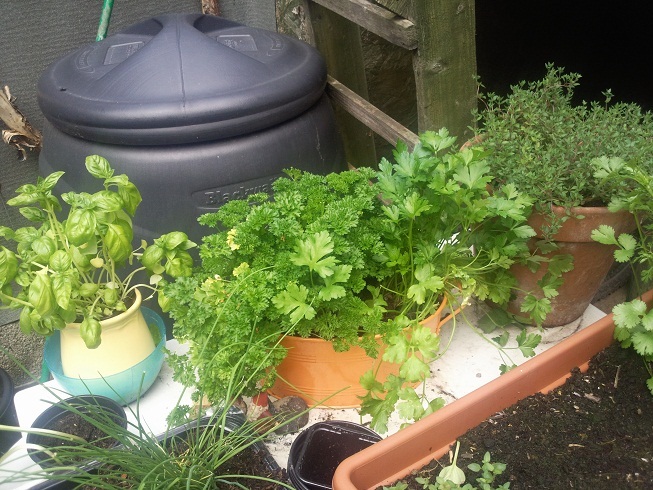 I have basil, thyme, flat and curly leaf parsley and mint. I’m going to grow some chives from seed next and I also want to try some rosemary. Looks a bit messy at the moment but I will get the garden more organised soon! 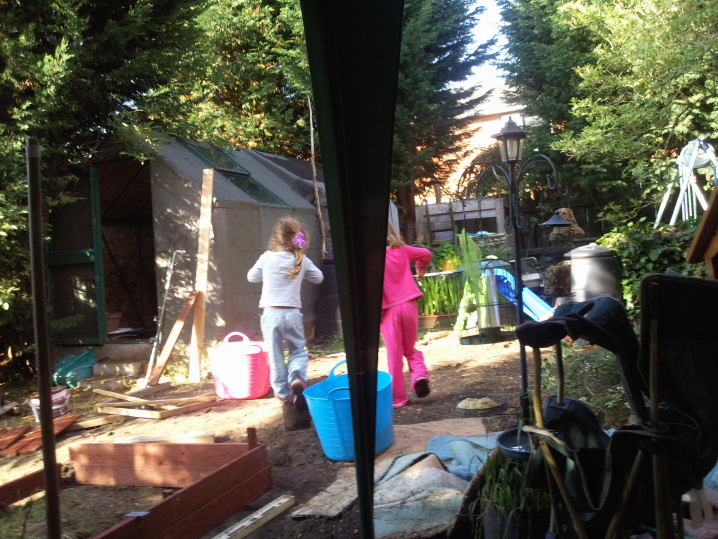 There are big changes happening in our garden at the moment. 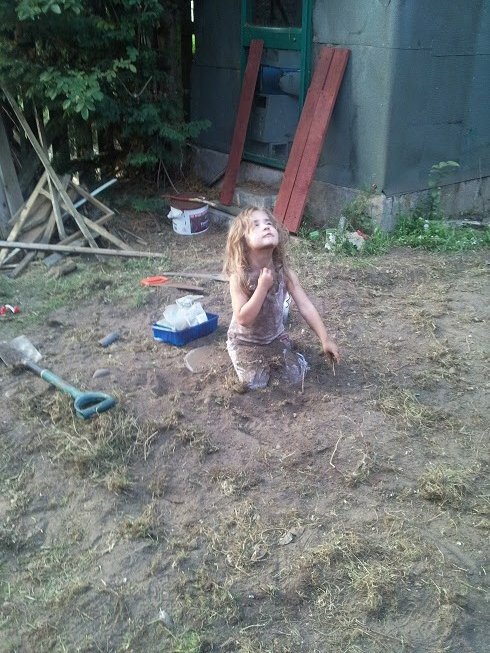 We had, at one time, a beautiful pond next to the patio and for the first two years, it was my pride and joy. I remember getting extremely excited when I saw the first frog in the pond. It was a great moment for me because as a child, we’d lived near a brook and I used to love seeing the frog spawn and playing with the tadpoles. I’ve always loved frogs and wanted our pond to be frog friendly. We planted a bog garden next to the pond with logs for the frogs to hide under and we made the pond slope gradually so it had a little beach to enable the frogs to get in and out easily. Ant and I were both at home a lot during this time. Anthony was getting over a serious episode of depression and I was a new mum. The pond gave us both something to do and a peaceful place to relax. Then came full-time work. First, it was Ant who went to work as a manager of our local laundrette/dry cleaners then I started helping out occasionally and was soon working all day, every day. 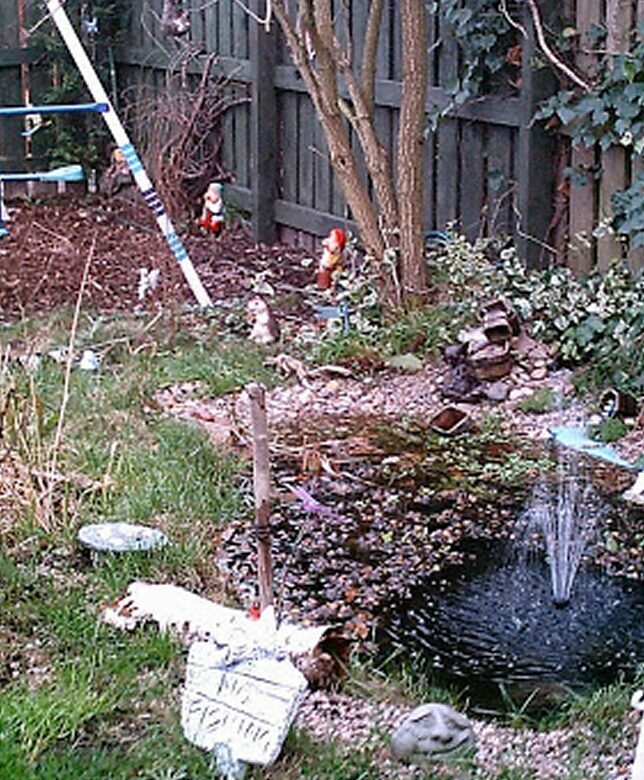 The garden and the pond especially got neglected. To make matters worse, after a couple of years at the laundry, it was sold to new owners and I was suddenly without a job. Ant had left a few months before it was sold, to go self-employed as an I.T. Consultant. 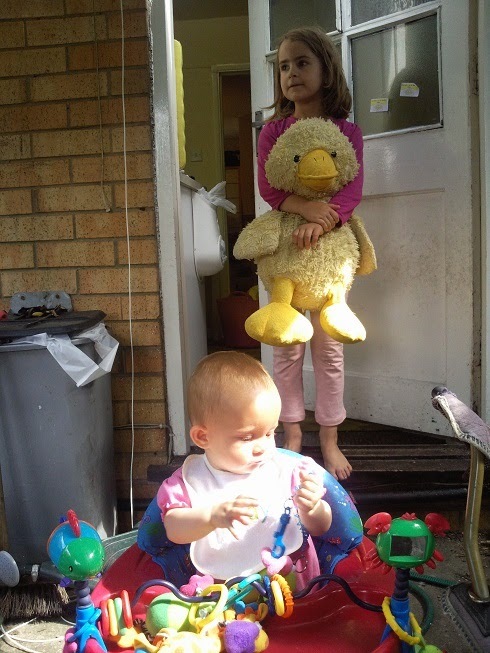 Business was slow at first and the combined drop in income meant things that weren’t essential (garden and pond) got left in favour of keeping us fed and clothed. This year, the bog garden is overgrown, the water in the pond is stagnant and the frogs are gone. It made me sad every time I saw the sorry state the pond was in. So last week, we emptied it. We were going to fill it in and grass it over but decided to make a sunken seat after seeing one on Gardeners World. I am, however, still going to be having a water feature *smiles* as I don’t think I could have a garden without one! We have a preformed waterfall that we’re going to set into a rockery under the elder tree. 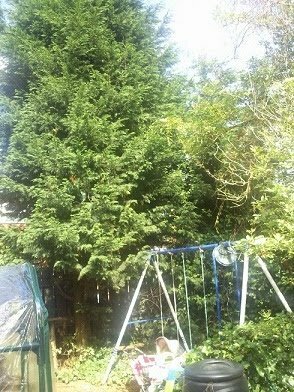 I adore the tree and can see myself sitting on the new sunken seat next summer, listening to the sound of the water trickling down and being shaded by the tree. Absolute bliss. We have a lot of work ahead of us but it’ll all be worth it in the end. 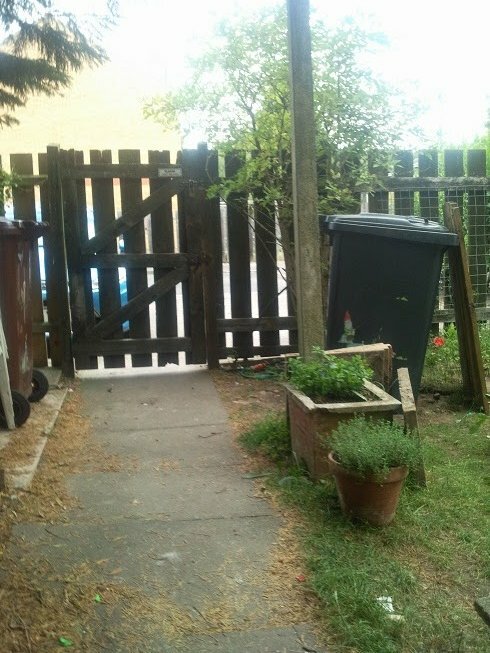 Here are a couple of photos to show the amazing change 3 years can make when you leave a garden to do as it pleases! 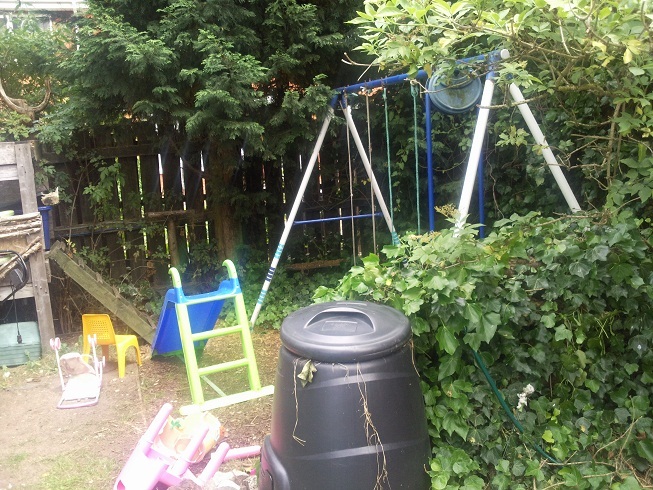 We can’t see the row of house in the first picture because the conifer has grown taller than the houses and all the ivy, Russian vine and goodness knows what else has covered the fence and grown up into the trees. It’s created a nice private garden but we had to help the trees and remove some of the ivy and vines before they did damage. I wonder how many of you have been thinking, what have wisteria and raspberries got to do with this post? Well here’s what I originally came to talk about and got sidetracked! My wisteria plant and raspberry cane were delivered yesterday and as soon as I’ve finished here, I’m going into the garden to get them planted. I’ve been doing some research and I found that wisteria originally grew up trees. They like their roots to be in a shaded spot and they take the goodness from the leaves as they fall and rot into the ground so we’re going to let it grow up another elder tree we have. It needs regular pruning to help it thrive and we have to make sure it’s not going to damage the tree in any way. I hope I can pull this off because it’s going to look beautiful when it flowers. The kids are going to love being able to pick their own raspberries from the garden. We’ve already got a blackberry bush and had great fun picking the berries, freezing them and then making a pie when we’d collected enough! So I’d best get started before it rains again!